Spondylolisthesis treatment can be conservative or invasive, symptomatic or curative. There are more options than ever before available to patients who are affected by atypical vertebral alignment issues. However, which treatments offer the best hope for providing effective pain relief or structural resolution of the causative condition? Back pain treatment is a very difficult topic to cover, since so much information is motivated and propagated by financial aspirations, rather than true efficacy of care. This can make matters very confusing for patients who just want to feel better, while care providers might be steering them towards less indicated methods of treatment that are more lucrative. This elevation of profit above patient health is a catastrophic problem in today’s greater healthcare system and is a constant reminder of doctors’ fiscal incentives throughout the dorsalgia therapy industry. This crucial resource section provides complete coverage of the various treatment options for spondylolisthesis. We will examine each selection in a dedicated essay and profile its risks, benefits, effectiveness and limitations to help patients find the best treatment for their specific needs and goals. Do You Need Spondylolisthesis Treatment? Being diagnosed with spondylolisthesis is just the start of most patients’ journeys. Patients must learn much in a short amount of time in order to make quality choices when it comes to their need for treatment of vertebral misalignment conditions. If they defer from this responsibility, they become pawns of the same greedy medical system that often guides them towards paths that are both hazardous and typically unnecessary, simply to generate money. If there is no pain and the listhesis is not deemed to be pathological or create any instability in the spine, then treatment is certainly not needed. However, medical monitoring should be considered a yearly or biyearly event in order to make sure that the condition does not require more proactive care. If pain is present, or if the condition is deemed to be necessary of therapy, then patients must take especially active roles in the care team. They must ensure that they will not become victims of medical exploitation by opportunistic care providers. The best way to do this is to seek out second and third diagnostic opinions from different types of doctors. If treatment is surely necessary, then patients must continue to be active in order to make the best choice between surgical curative treatment and symptom-targeting conservative care. This can be a complicated choice, but we cover both topics in full and are sure to provide helpful guidance in our respective patient guides. Which are the best drugs for spondylolisthesis? Are some drugs more effectual and less dangerous or is pharmaceutical therapy inherently flawed? Chiropractic for spondylolisthesis is a very widely-used conservative healthcare management practice that may also be used to specifically target listhesis conditions for pain relief. Spondylolisthesis exercises are some of the most often employed physical therapy modalities that can be performed at home by patients to help strengthen and support the deficient region of the spine. Back extensions are one of the most commonly utilized stretches. Acupuncture for spondylolisthesis can provide pain relief without many of the risks of traditional medical modalities, like drugs or spondylolisthesis injections. Massage for spondylolisthesis will not address the skeletal issues, but may provide beneficial rewards for supporting soft tissues in the affected spinal region. Posture therapy for spondylolisthesis may help patients to minimize pain and functional limitations by optimizing anatomical positioning. TENS for spondylolisthesis provides nerve signal disruption and subsequent pain mitigation using electricity directed towards sensitive nerves. Inversion for spondylolisthesis is an age-old technique that reverses gravity to relieve pain and possibly even provide temporary structural change in the lower spine. It is a common patient and care provider objective to stabilize spondylolisthesis, so that it can not progress to ever-worse degrees. However, stabilization is difficult to achieve using conservative care and might require invasive operative interventions. Spondylolisthesis therapy regimens often places the classic surgical versus conservative philosophies at odds with one another. Is surgery or noninvasive treatment the best choice for most patients? Symptomatic spondylolisthesis treatment does not seek to resolve the anatomical change of listhesis, but instead focuses on decreasing the severity of pain and related neurological expressions. 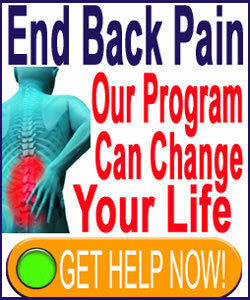 Our excellent pain relief program is highly effective for ending back pain and neck pain due to many diagnosed sources. It is no surprise that the program has earned top honors from notable care providers worldwide. We tend to caution patients that statistically, grade 1 and 2 listhesis generally do not require treatment. 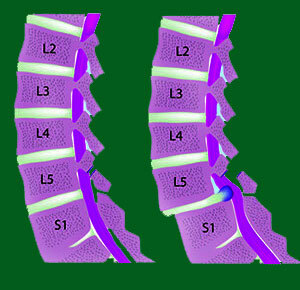 This is not to say that back pain is not present, for listhesis patients have the same chance of developing dorsalgia from many, many possible sources as any other person, with the addition of the chance that pain might be created as a direct result of contributory factors of the vertebral migration condition. For patients with dire grade 3 and 4 spondylolisthesis, surgery can fix the anatomical defect and help them to move forward in life without the continual reminder of a pathological spinal abnormality. However, this benefit comes at the expense of a reduction in the range of motion in the spine, the chance for many complications and the accelerated degeneration which are all inherent to spinal fusion. Meanwhile symptomatic care allows some patients to avoid surgery, but instead makes them slaves to various pain management modalities, some of which may be incredibly risky. Worse still, their underling vertebral slippage will never be addressed, allowing the condition to potentially progress in the future until surgery becomes a necessity anyway. Take time, invest effort into research and make quality decisions regarding your care. If you will not advocate for yourself, then no one will.